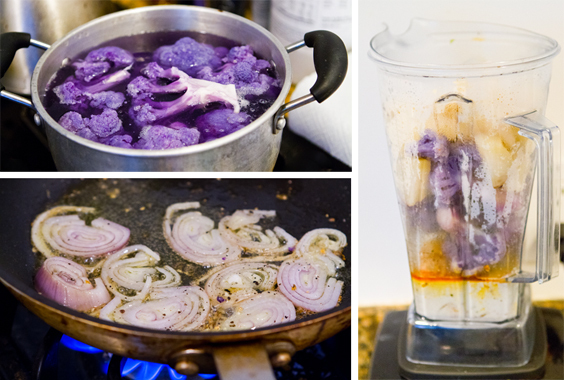 Fluttering through the produce section of Whole Foods on a seemingly ordinary shopping trip, I fell in love with a head of purple cauliflower. Veggie love at first sight. 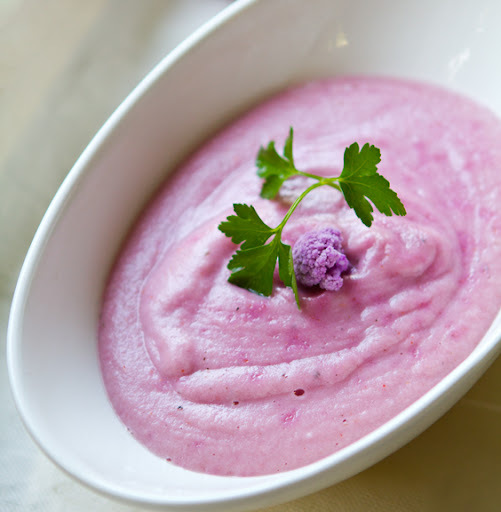 My eyes locked with those buttery florets of purple - hugged by broad green leaves - and a recipe flashed before my eyes. 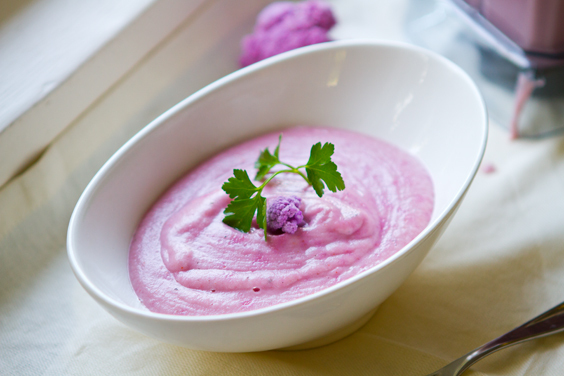 The most pretty in pink soup ever. 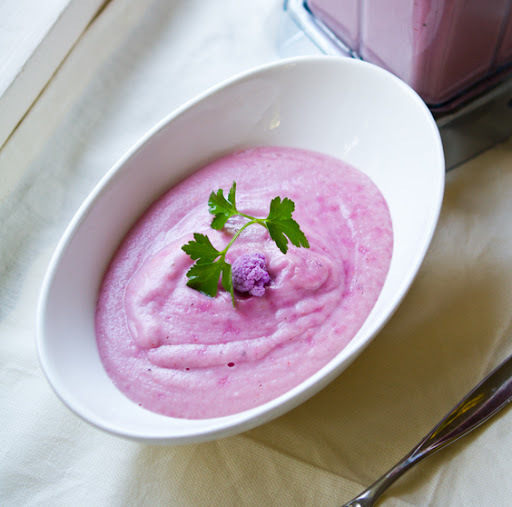 Make this soup - and even if you don't have "purple" cauliflower I have an alternate recipe route..
Rainbow-colored veggies like red carrots and purple cauliflower are a new trend I discovered way back at the NYC Produce Show. 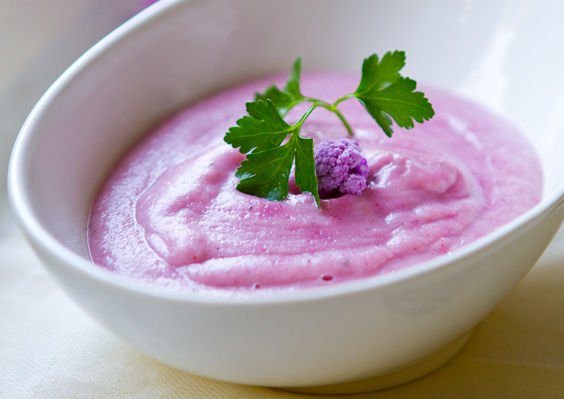 More colors mean more healthy antioxidants. 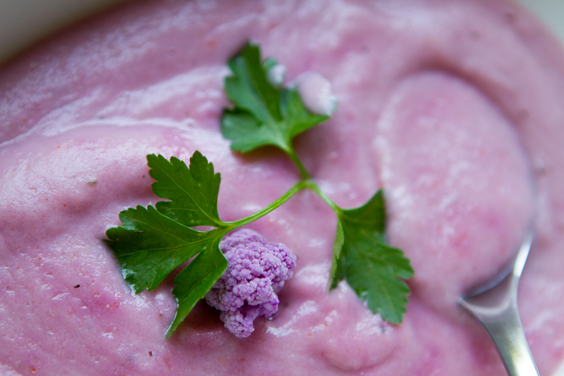 And FYI, these colorful creations are natural - created through "traditional plant breeding." Ancient heirloom colors come to life. More info here from the Colorful Harvest website. So when I finally spotted this cauliflower on store shelves I grabbed it. Those pastel purple-blue clusters looked like something out of a Rainbow Bright or Care Bears episode. 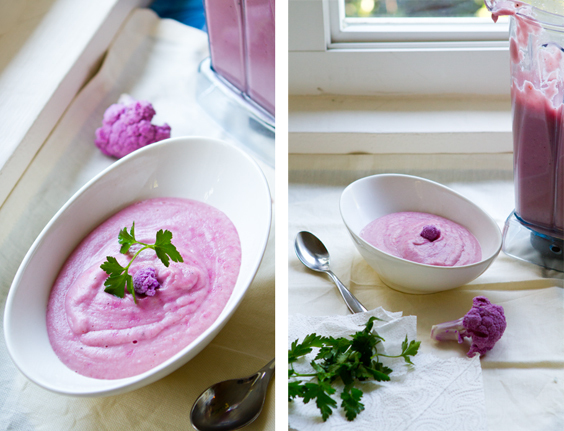 Hint hint, these colorful veggies may be just the thing to serve to the kids in your life - white cauliflower - boring. 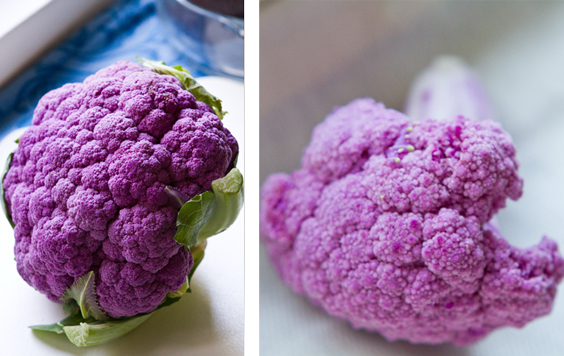 Purple cauliflower? Super fun. Fun Food Color Fact -> Did you know that when it comes to food allergies, just because you are allergic to say, orange carrots, you may not be allergic to white carrots. 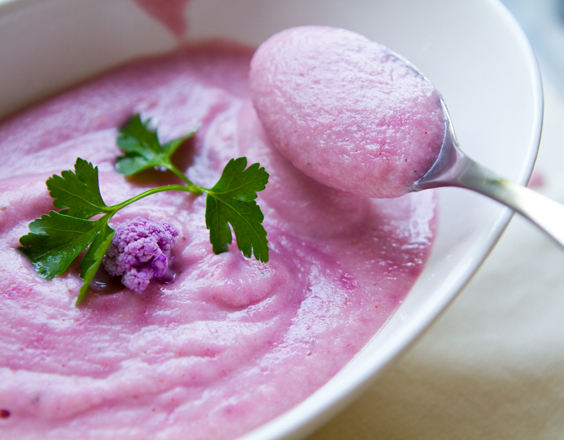 Color pigments in foods can have a major impact on allergies! 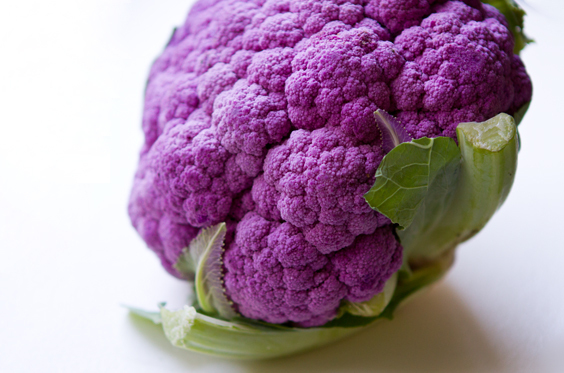 Can't find purple cauliflower? 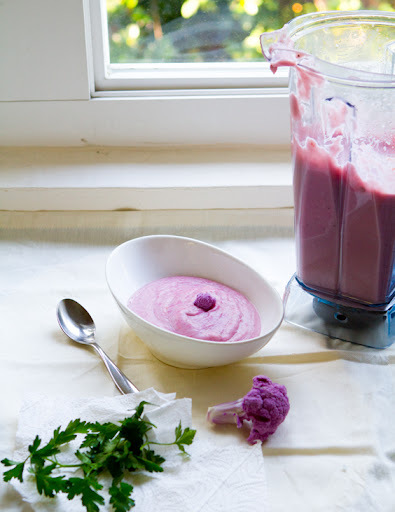 If you don't have purple cauliflower (and use white) you can add some beet juice - or blend in 1-2 small boiled beets to create a more reddish color. 4. Add in the vinegar. You will watch the color intensify to a pinkish tone. Yay. 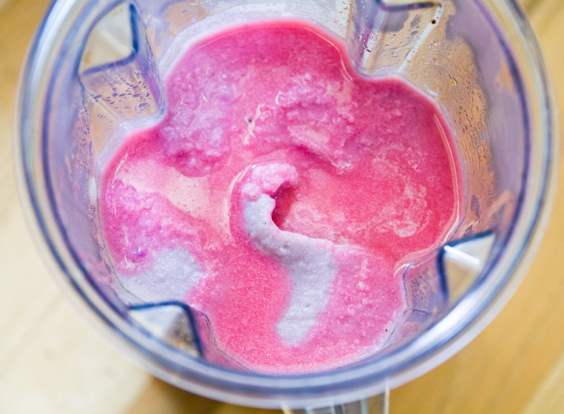 Blend on low. Do a taste test and add in more pink salt if needed.